I recently read The Baby Trail by Sinead Moriarty and absolutely loved it so it was not surprising that I could not wait to get my hands on another of her books. The one I chose was In My Sister’s Shoes which, in my opinion was even better. It was the sort of book that once I had started reading it; I could hardly put it down. In fact I read it in the space of two days which, considering I have two young daughters is some going! The story follows two sisters – Kate and Fiona. Kate is just embarking on a potentially successful TV presenting career and has left the family home in Dublin to seek her fortune in London. Fiona is married to Mark and they have five year old twin boys who often prove to be quite a handful. The sisters’ lives could not be more different and they don’t have that much in common, although as children they were quite close with Fiona having virtually bought Kate up after the death of their mother from cancer. However, things change dramatically when Fiona is diagnosed with breast cancer at the same age as their mother. Kate is persuaded by Mark to put her career on hold in order to come home and help while Fiona undergoes a painful operation and then months of chemotherapy followed by intense radiation. Kate is really torn especially as her career is just taking off and as she has only seen her nephews about twice a year she feels that she hardly knows them. However, there can only ever be one option for her so she returns, with a certain amount of trepidation, to Ireland. As you can imagine there are lots of ups and downs as both Kate and Fiona embark on their own journeys. It does not help that Kate does not get on with Fiona’s husband, or that she does not have any experience of looking after small children. At first she is totally daunted and also a little resentful of having to be there, especially when Mark does not seem to be pulling his weight. However, as time passes, she grows to love the boys and also renews her close relationship with her sister as she tries to support her morally through her ordeal. Life gets more interesting when Sam, her first boyfriend appears back on the scene, but are the differences that caused them to separate first time around still there? As Fiona reaches the end of her treatment, Kate is faced with a difficult decision – does she return to London to resume her career or does she stay closer to home and enjoy the time she has with her family and son? There’s only one way to find out and that is to read the book! In My Sister’s Shoes is a beautiful written book that had me hooked from the very first page. Sinead Moriarty has an extremely easy style to read and she has the ability to make you laugh one minute and to cry the next. It is an extremely poignant storyline which leads to some very moving writing. The emotions that both sisters go through are portrayed so well – their fear and determination and the realisation that Fiona is the same age as their mum when she died. There is also a younger brother called Derek who always presents a bit of light relief from the more sombre storyline. He is an aspiring rapper and along with his ever optimistic friend Gizmo, he is still waiting for his big break, causing their father to despair. Some of the things that they get up to just had me laughing out loud! He does have a more caring side though which is demonstrated when Fiona’s hair starts to fall out. As an act of solidarity, both Kate and Derek decide to shave their heads as well which is much appreciated by Fiona. This was one of the most moving moments in the whole book and had me in floods of tears as I was reading! The story is written in the first person and is told by Kate so she is the character that the reader gets to know best of all. I always like first person accounts as I feel you really get inside the character’s head, and this one is done especially well. Kate really does experience a whole gamut of emotions through the year in which the story takes place, and as a consequence, so does the reader. I really felt that I had been on an emotional rollercoaster by the time I finished reading. That was good though and as Kate is such an interesting character, she almost felt like a friend at the end. Each character is very believable and Kate, in particular, is very likeable and the sort of woman who you would hope to have on your side. Out of all of the characters, Mark is the hardest to like, but even he has his more human side and I did find myself becoming more sympathetic towards him as he struggled to deal with his wife’s illness. 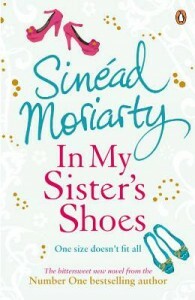 In My Sister’s Shoes could have been a bit of a depressing read, especially with the descriptions of Fiona’s treatment which is very traumatic. It is not depressing in the least though. It is moving, funny and one of the most uplifting books that I have read in a while. I heartily recommend it if you like this sort of book. No Comments on "In My Sister’s Shoes"